In Matthew Heineman’s documentary Cartel Land, Mexicans covered in bandannas take hold of a barrel filled with acetone, sulfuric acid, pseudoephedrine, and antifreeze or some of the toxic chemicals used to cook up the drug crystal meth. Nighttime cloaks this deadly but profitable activity. As Heineman’s hand-held camera turns our eyes on toxic liquids poured and stirred to concoct the crystal meth, it becomes apparent that we are in the belly of the drug business. One of the gun-toting chefs who cook the crystal meth explains in Spanish, “We know we do harm with all the drugs, but what are we going to do? 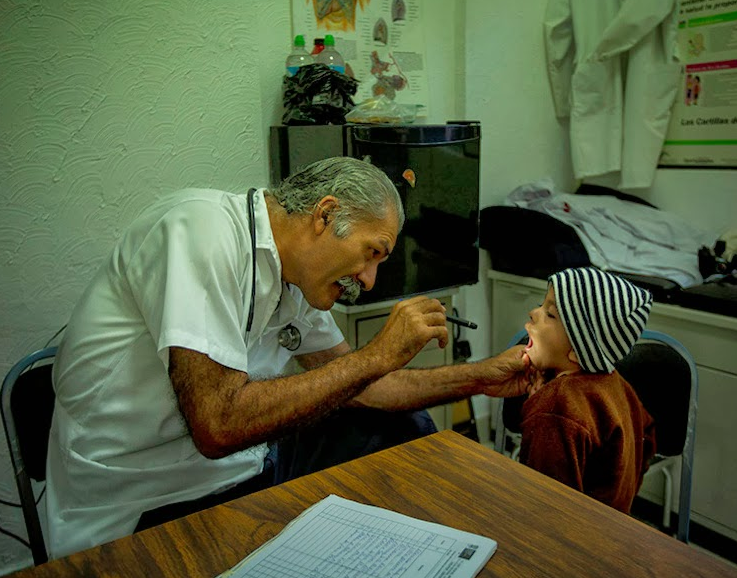 We come from poverty.” Cut to Arizona, and we are taken into the mindset of Tim Nailer Foley, the self-appointed vigilante and head of border patrol in what is known as Cocaine Valley. Foley maintains, “technically we are vigilantes upholding the law where there is no law but the phrase vigilante has been given a bad name by the media”. 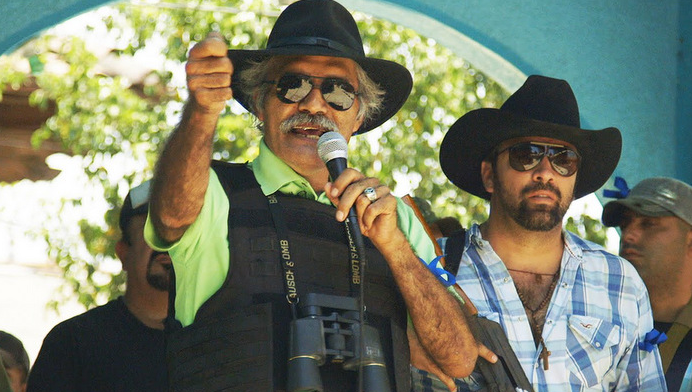 Cut to Dr. Jose Manuel Mireles, a surgeon and grandfather, is the charismatic handsome leader of the Autodefensas, a paramilitary vigilante group in Mexico that has assumed the responsibility of protecting the city of Michoacán from drug cartels. Yes, there are many trains running through this very intense and superbly drawn dramatic thriller. … and Heineman refuses to coddle our feelings; his camera pierces through every shootout in Mexico, and every trek made by Foley and his crew in Cocaine Valley. Hold on to your heart! Marie Antoinette nor the Roman Emperor Nero had nothing on the devastation wrought on Mexican citizens by the drug cartels. The blood from severed heads of victims stain the concrete; some of heads are perched on stakes in the city for viewing; there are poignant stories about babies and children being taken by the legs and bashed against stone; husbands set on fire as wives watch and hear their screams. Torture. Fear. Confusion. Betrayal. Assassination attempts all combine to make for a poignant 100 minute of information and discovery! While Cartel Land visually goes where even angels fear to tread, Heineman emerges as the star of the show. The documentary delivers an up-close and personal view of all action that it has to remember to stop and allow the players to give their commentary! At times, it seems as if this director is trying to collect all of the information he can before time runs out! Heineman does manage to conclude that no matter a group’s good intention to protect people from the evils of the world, violence is durable and resilient. Any change of the guard will undermine the good will of a group. What also comes to focus is that vigilantism is fragile, and once its power and influence on communities are sniffed out by the government what becomes of that power and influence? This is the question Heineman answers in Cartel Land!